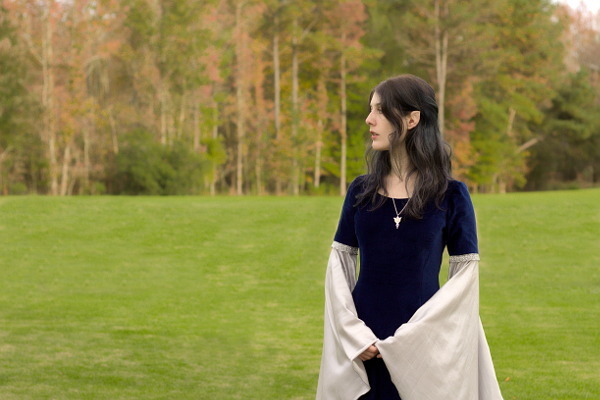 At first I wanted to recreate this dress worn by Arwen/Liv Tyler in the first movie of the Lord of the Rings trilogy. Unfortunately the pattern that I found to be the closest match, McCall’s 4491, was out of print. After searching for a second best in vain, I ended up splurging and buying it on eBay. I don’t regret it at all: I know it’s a costume, but the shape and fit of this dress are marvelous! 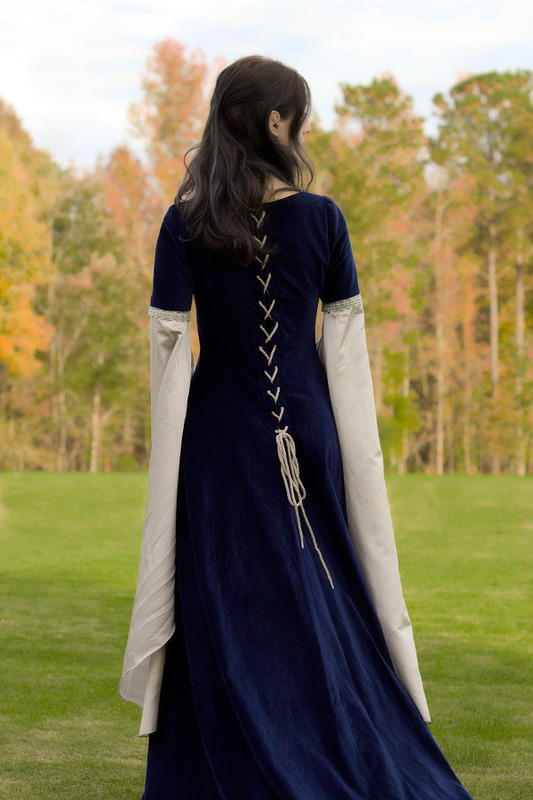 The pattern has princess seams on the front and back that follow curves nicely. The sleeves are set with an underarm gusset (sadly I have no pictures of it) that are a bit tricky to sew but create a lot of movement ease. The reason my dress is more plain than my inspiration is because I had a lot of trouble finding embroidered trim that is not cheap-looking. I went to a bunch of stores and even bought yards of laces and silver beads, but once pinned on the dress everything looked pretty meh. 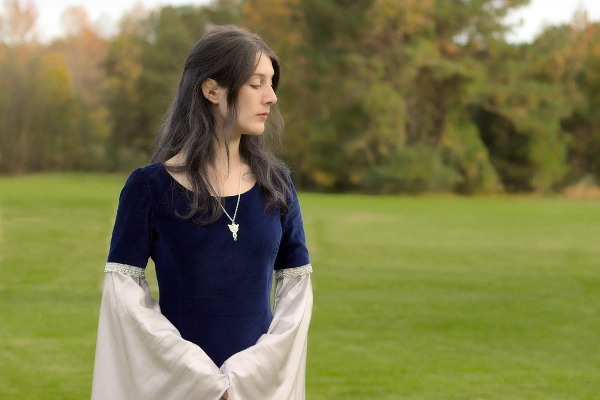 Cosplayers, where do you get your trims? If you have online stores to recommend, I’d love to hear about them. 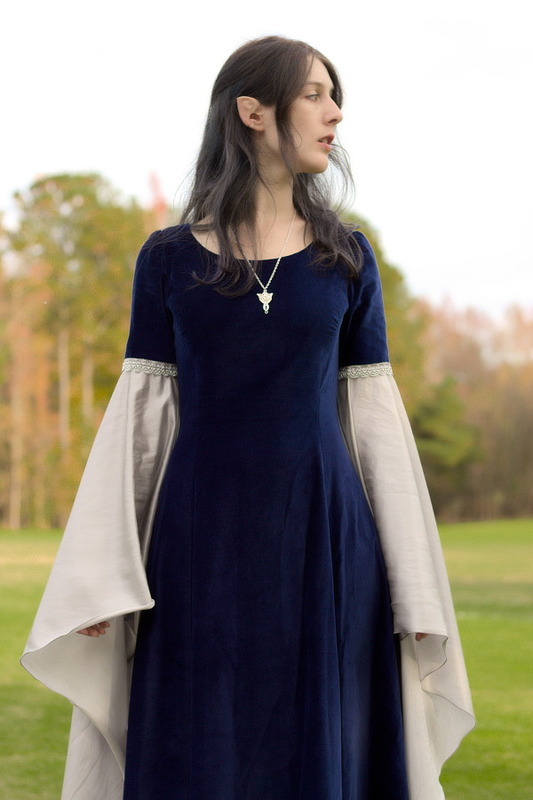 The amount of fabric needed for this pattern is huge, between the enormous sleeves and the dress panels with the train, I had to order 5 yards of velveteen and 4 yards of cotton/silk for the sleeves, even without lining them. 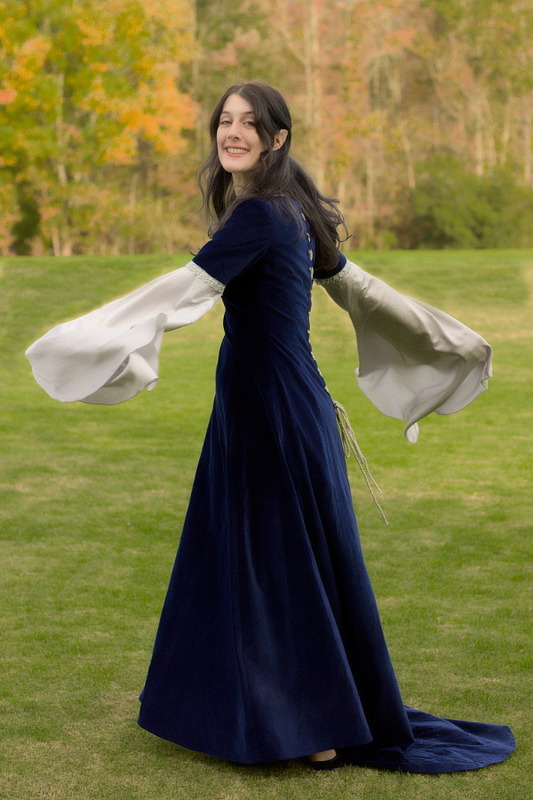 And given the price of these types of fabric, you’ll need to plan for a decent budget is you want to make this dress… The result is pretty crazy though, it was really fun twirling around on the dancefloor with the sleeves and train. It was slightly less fun to have to deal with the train between the pedals and the sleeve getting stuck around the gear stick of my tiny rental car! 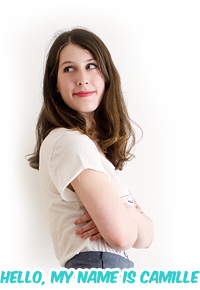 It was also the first time I was sewing with velvet (I did make a corduroy skirt once but it doesn’t really count). I followed the advice from Threads magazine: pin and baste as much as possible, and do not iron directly but use a lot of steam. I also used a clapper to open my seams: after using steam, you press the wooden block on the seam firmly. 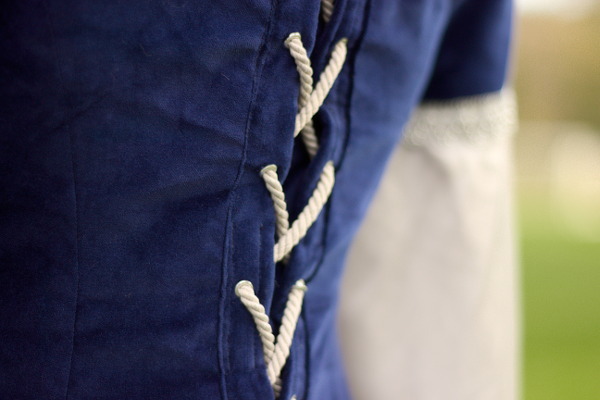 It was a bit tedious to do this on the whole length of the princess seams but it really made a difference. My only technical issue with this dress is that I made the mistake of not interfacing the bands in the back before putting in the eyelets. 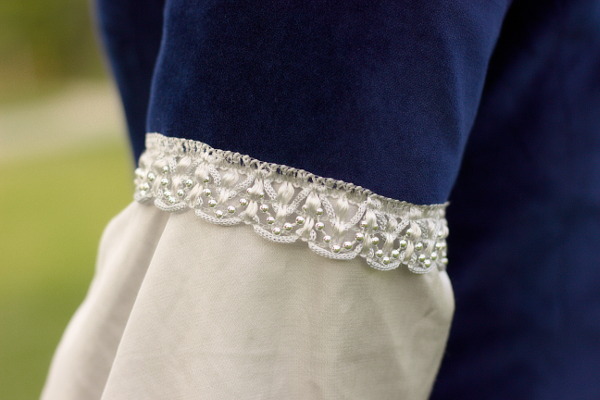 The lacing completely destroyed them: the fabric was fraying and the eyelets were coming off, so I had to put them back on by adding a little square of twill fabric on the back of the band. Not pretty but it did the job. Of course, it is not a dress I’ll wear often, but I’m glad I got the opportunity to make it and that I spent so much time on this project. It was a technical challenge for me and I feel like I made a lot of progress. 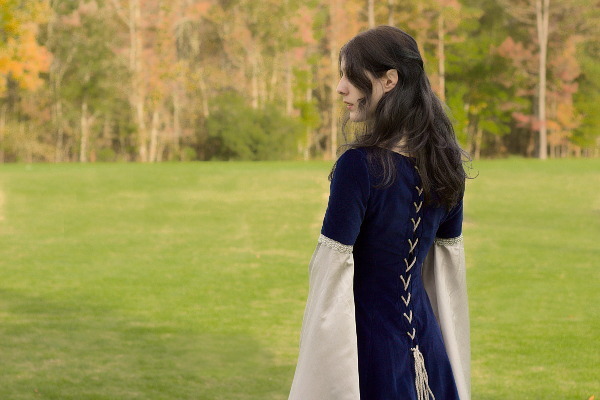 I strongly recommend this pattern if you are ever in need of a medieval gown! I’ve got this pattern. I made it up in cotton (the only thing I could get) for hallowe’en several years ago. Sadly it doesn’t fit anymore but I remember how comfortable it was. Twirling in velveteen must feel lovely.